The Ambassador of India to the Republic of Maldives, His Excellency Akhilesh Mishra made a farewell call on His Excellency Vice President Faisal Naseem this morning at the President’s Office. 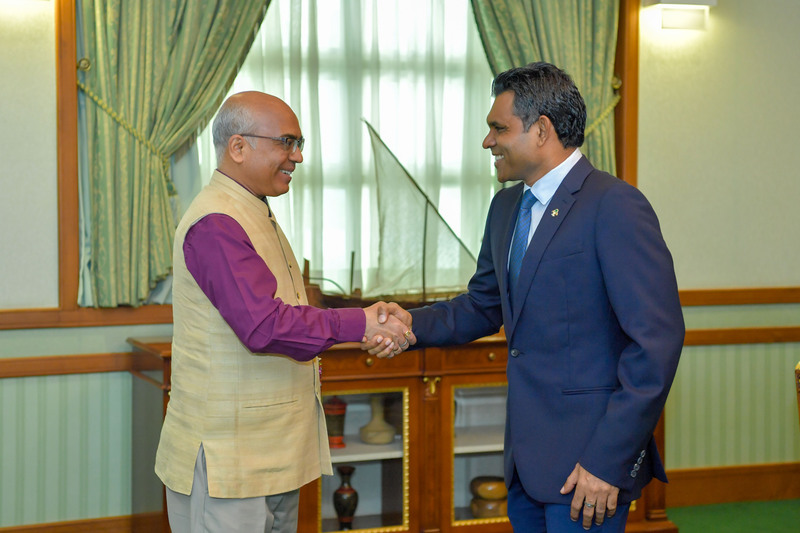 Vice President Naseem conveyed his sincere gratitude and appreciation for the immense efforts made by the Ambassador to strengthen bilateral ties between the two countries, and the generous support he has extended to the Maldives during his ambassadorial tenure. Moreover, he expressed his sincere hope that Maldives and India will always remain close friends and partners. Ambassador Mishra reciprocated these positive sentiments and reiterated his own commitment to continue working closely with the Government of Maldives in all spheres of common benefit. The Ambassador stated that he found the way Maldivians overcome challenges to be inspirational and hoped that the robust people centric agenda between India and the Maldives would continue to flourish. In closing, the Vice President acknowledged the warmth and amity with which Maldivians have come to regard the Ambassador, due to his gregarious disposition, and the efforts he has taken to learn the Maldives’ cultural traditions and language. The Vice President finally remarked that whilst he wishes the Ambassador good fortune in all his future endeavors, and that he will always be welcome to visit the Maldives as a friend.